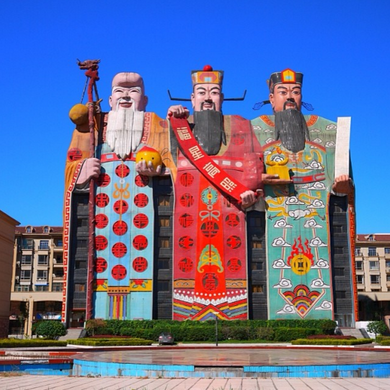 Where better to stay the night than inside a trio of ancient Chinese deities representing "the good life." 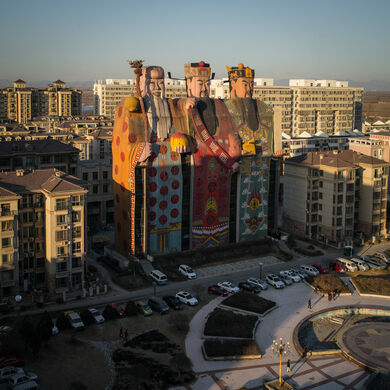 Despite a looming ban on “weird architecture” that may rob the world of some phenomenal – and gigantic – works of art, China has already given us the glorious Tianzi Hotel, a many-storied edifice comprised of three old men in colorful, traditional garb. 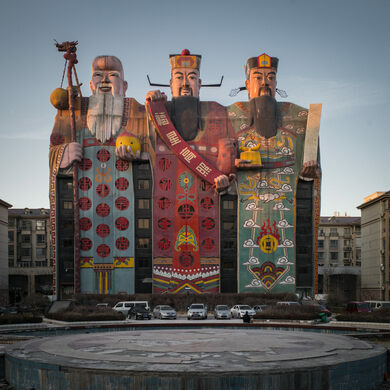 The English translation for “Tianzi” works out to something like “Son of Heaven,” which makes sense given the bearded figures after which the hotel is modeled are intended to directly resemble three Chinese gods. 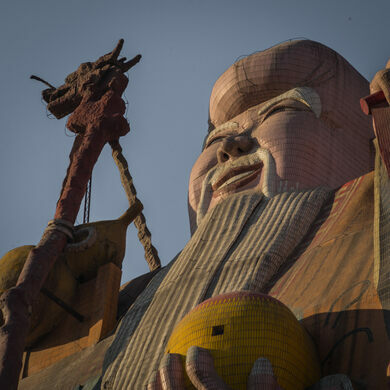 Dating back to the Ming Dynasty (which reigned from 1368 to 1644), these deities are personifications of the three attributes assumed for a good life. Each god also has both an astrological and historical association. At center, in the red robe, is Fu (福). Linked with the planet Jupiter and fortune, Fu is believed to be auspicious in traditional astrology. The righthand anthropomorphized building in green is Lu (禄); representing prosperity, specific associations he word lu specifically refers to the salary of a government official. As such, the Lu star is the star of prosperity, rank, and influence. The jolly white-haired figure at far left resembling Santa Claus is Shou (寿), who is closely associated with longevity. 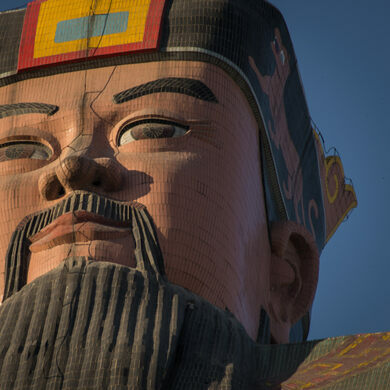 In Chinese astronomy, his star is that of the South Pole, which is believed to control the life spans of mortals. 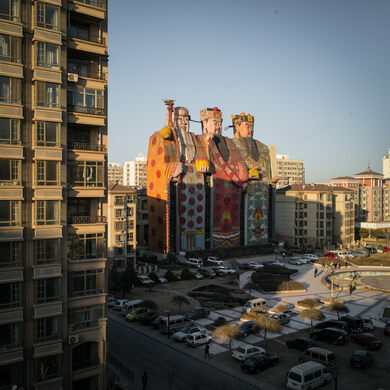 Just as in traditional Chinese iconography, Shou always carries a peach, and the Tianzi Hotel is no different: the peach room is available for rent! Despite consistently ranking among the upper echelon of one bizarre hotels in the world, precise details regarding the interior of this turn-of-the-millennium masterpiece is scarce; rather tales of visits are passed down from traveler to traveler. 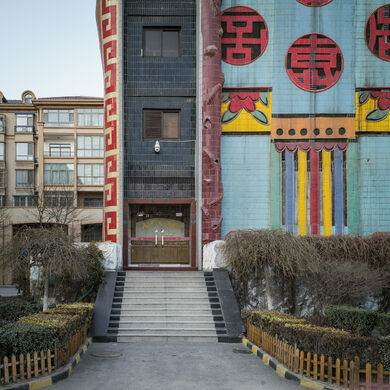 In an age where the Internet allows us to find most lodging’s details down to their exact metrics before booking – let alone arrival – staying inside a row of legendary gods based on a mixture of word of mouth and your favorite fluent friends playing translator makes the Tianzi Hotel all the more delightfully, magically mysterious. This can be a nightmare to find. It is actually in Xixinyingcun on the G102 heading about an hour East out of Beijing. Even Google maps in this area cannot keep up with development. The GPS coordinates are 39 57'10.02, 116 52'1.62. Be warned much of the internet will tell you it is in completely other cities!